Performers: Predominant is the female two-part singing. Rarely, in single cases, there are men groups performing two-part songs. The melody voice is sung by one singer and the bourdon voice - by two or more. In particular settlements in the Sofia region (the village of Bistritsa, for example) there are cases of three-part song tradition - performing of bucheni songs. The performance is without accompaniment. The singers are divided into two groups of three (sometimes more) singers performing antiphonally (the same melody is performed by each of the two groups, first by one and then by the other). Structure: The upper voice performs the melody in small diapasons - of two, three and rarely four tones. The lower voice is constructed as static (mono-based) or fluctuating (deviating for a moment down to the subtonium) bourdon. In some cases the lower voice sings the lyrics together with the upper one; in other, it sings the sound [e] at a single tone, instead. The second is the basic harmonic and melodic interval in the construction of the multipart songs. Crossing of the upper and the lower voices is not typical for the region, but may be found in some settlements. The multipart singing in Middle West Bulgaria has a specific style of ornaments. One of its typical features is the tresene (an ornament resembling a tremolo vibrato), performed by the upper voice. Another ornamental detail is the provikvane (a glissando-like downward movement of the voice from an upper tone), which may be performed by the whole singing group. According to their metro-rhythmic organization the multipart songs in this region can be divided into non-measured and measured in various measures (2/4, 5/8, 7/8, 8/8, 9/8, 10/8). Local terminology: There is a folklore system of terms naming the functions of each voice and its performers. The performer of the upper voice is called okachka, izvikuvachka, vodachka - she oka, izvikuva, vodi, grachi, kreka, seche. The performers of the lower voice are called pomagachki, slagachki, vlachachki - they pomagat, slagat, vlachat, buchat. The antiphony singing is called na otpev, na otpyavane, and the two groups are called cheti, tri po tri. Functions: The multipart singing is practiced in the following situations: at calendaric and family rituals (ritual multipart songs); at harvest and working-bees (labor multipart songs); at horo (feasting multipart songs). The contemporary state: The multipart singing in Middle West Bulgaria is nowadays a relict practice, which is kept in a little number of villages, mostly by mature and older women. Attempts are made for its preservation through teaching the traditional performance style and repertoire to younger singers, amateurs and professionals. The modernization of the style results in reducing the groups to duets or trios, adding an instrumental accompaniment to the multipart singing. *For more information on the multipart singing in this region and on the vocal bourdon as a principle and style in the vocal combinations see also Kaufman N. 1968: 20-45; Stoin E. 1981: 17-102; Abrasheva 1974: 18-31. Performers: The number of women singer is predominant according to the tradition of this region (at least with about 70 percent of the songs). The upper voice is performed by a single singer, and the lower voice - by two or more singers. In some settlements (Dolen and Satovtcha), the two voices are performed by groups of three or more singers. The tradition of the Bulgarian Muslims from Razlog and Gotse-Delchev regions is typical with two-part songs sung by two women, one performing the upper voice and one performing the lower voice. 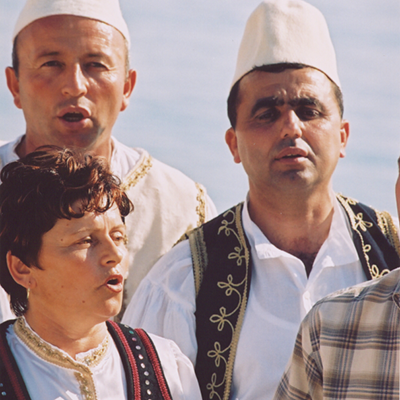 Along with the female singing, in the Pirin region one may also observe a mixed type of men and women singing together. The multipart singing of male groups is widespread today. Three-part singing is registered in the Konomladi village in Petrich region and in Sofia among groups of immigrants from Kostur region in Greece. Singing without accompaniment is predominant but there is also a tradition of multipart singing with accompaniment of tambura, trempe, tarambuka. Structure: The basic melodical interval in the building up of the upper (melodic) voice is the second. Another widely used intervals are the third and the fourth. Rarely one would meet cases of quint, sixth. seventh (at provikvaniya), octave or even ninth. In some cases the upper voice may go down to the subtonium. The lower voice may be built in some different ways: as a constant bourdon tone on the tonic; as a dia-based bourdon with configurations of III-I degree, IV-I degree, II-I degree. Although rarely, the lower voice is constructed on three or more basic tones. In the combination of the two voices one may sometimes observe a criss-crossing. There are songs with limited tone scope at a lying lower voice, as well as melodies with expanded scope at a flexible lower voice. Typical ornament methods in the multipart songs of Southwest Bulgaria are: tresene, hlûtsvane, provikvane. The tresene (a peculiar sort of tremolo) is, in the typical ornamental manner of the Pirin region, a larynx fragmentation of the note values by getting down to the subtonium. The hlûtsvane is a swift cry of an undefined tone with the active participation of the larynx (similar to an upward glissando movement). The provikvane is a diversion of intonation in an upward direction on a vocal without any significant relation to the song text. Unique (typical only for the tradition of particular settlements in the region) ornamental styles are the atsane (Bansko) and the na visoko singing (Dolen and Satovcha). The atsane is a singing effect requiring a specific performance technique. It comes up at the end of the musical half-sentence, being preceded by a continuous trembling of the melody in the high register of a certain tone. The women-singers cry out at an octave or seventh tone, which they leave gliding in a descending manner. The na visoko singing is typical with repeated crying-outs at an octave starting from the 1st degree or at a ninth starting from the subtonium and going back to the lower register with short recitative. Typical for the na visoko songs are the harmonic interval of octave and the melodic interval of large ninth. The multipart songs from Pirin region are non-measured or measured. The measures that are most commonly met are 2/4, 3/4, 7/8, 5/8, 8/8, 9/8, and 11/8. Local terminology: The local singers define the antiphony singing as otpevane (nie ke zapeem, vie ke otpevate). The singing groups are called chiftove or chingure, whereas the notion chift does not mean groups of only two but also of three or more singers. The coincidence of the voices, the orderly harmonious singing is called glashene, shojdenie. The singing of the upper voice is called izvikvane, izdigane, digane, vodene, and its performers are called izvikvachki, izdigachki, digachki, vodachki. The lower voice is said to slaga, polaga, pomaga and their equivalents as related to the performers are slagachki, polagachki, pomagachki. Functions: The multipart songs are related to the following contexts: calendaric and family rites, harvest, working-bees, horo and table. The contemporary state: The preservation and the revitalization of the tradition, so typical for the Pirin region, help keeping the multipart singing practice in this region somehow alive, even today. The spontaneous multipart singing still exists in some settlements (along the valley of Mesta river). 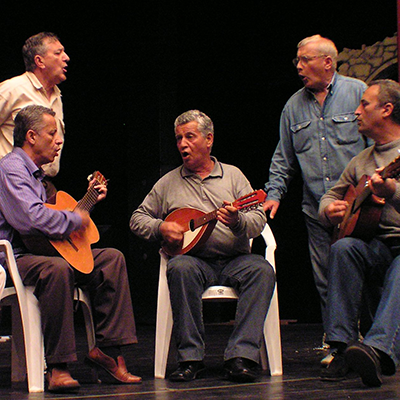 In Southwest Bulgaria there is a variety of forums (gatherings, festivals, concerts), institutions (medias, chitalishta, publishing houses), formations (male singing groups, vocal-instrumental orchestras), provoked by the institutional preservation and popularization of the traditional music, all of which are contributing to the local multipart singing tradition. * For more information on the multipart singing in this region see also Kaufman, N. 1959, Kaufman N. 1968: 70-112, 127-131, Kuteva, Elena. 1976. Performers: The two-part singing is predominating in the local music-folklore style. Almost all of the performers are women, singing antiphonally in two groups of two. There is no instrumental accompaniment. Structure: The upper melody voice is usually built on four to five tones. There are two cases of the lower voice structure. The lower voice may be built up as a mono-based or dia-based (I-III degree) bourdon, or it may be progressing in parallel with the upper one, in this way sketching the main melody line. In this second case the lower voice trese (makes ornaments on I and II degrees by breaking-up a note). In the songs, where the lower voice has ornamental functions, the tresene is much like a specific homonymous ornament, which is typical for one-part, table songs from the Graovo region of Middle West Bulgaria. In the vertical structure of the multi-part singing the upper and the lower voices sound close to one another, usually at a maximum interval of fourth. Local terminology: The specific sonority of the second harmonic combinations is defined in the local terminology - for a well-sounding two-part song the people say kato dzvûnets dzvûni. The upper voice is said to izdiga, nadiga and izviva. In some settlements the lower voice is defined as slagane, polagane and in others as tresene and more rarely kûrshene. Functions: The two-part songs of the region are mostly of festive (at horo, at table), labor (at working-bees, at harvest) and ritual (at weddings) character. The two-part songs performed at horo or working-bees are mostly with bourdon lower voice. The songs performed at harvest, at weddings and at table are mostly with ornamental lower voice. The contemporary situation: The two-part singing deeds are limited to a manifestation of a conservative local tradition on festivals and gatherings for folklore music. *For more information on the multi-part singing in this region see also Kaufman, N. 1968: 45-58; Botusharov 1972. Performers: The two-part songs are performed by women. There are rare cases of some settlements with two-part men singers. The singers form groups of two persons, one singing the melody and the other - the bourdon. Predominant is the multipart singing without instrumental accompaniment, excluding some particular cases of localized multipart singing tradition. In some settlements in the region (Dorkovo, Rakitovo, Peshtera), along with the Bulgarians (Christians and Muslims) there also live Armani, who also practice two-part singing in their musical tradition. Structure: The upper voice moves in a limited range - up to a fourth. Another typical feature of its structuring is the centering of the melody around the tonic in some ritual songs. The lower voice differs in its character: it may be a bourdon; may move over V, IV, III, I degree; may sketch a melodic line. In some cases, where the lower voice follows the melody of the upper one, it emphasizes the meaning of some degrees of the mode development (III and IV degree) and sketches along with the upper voice some typical for the region second consonances, defined as powerfully-sounding sharp, beating. When the lower voice follows the melody of the upper one, the two voices are usually situated close to one another, but there are songs where one can observe large intervals between the two voices. The crossing of the two voices (reaching second, third and more rarely fourth intervals) is typical for the local multipart singing. Local terminology: The singers from the region say that the upper voice vodi, and the lower one vleche or vlachi. Functions: The two-part songs are performed on calendaric and family ritual situations, at working-bees, at harvest, at horo, at table. The condition today: The two-part singing, typical for the traditional agricultural community is still practiced in some settlements of the region. The living tradition is to comparatively greater extent kept alive in the mountain villages, inhabited by Bulgarian Muslims (Pomaks). The tradition of the two-part singing finds modern realization in new contexts and forms: festivals, gatherings, male and female singing formations at chitalishte** institutions. *For more information about the multipart singing in this region see also Kaufman N. 1968: 58-70. **Chitalishte - A form of organization of cultural life, which is typical for Bulgaria. 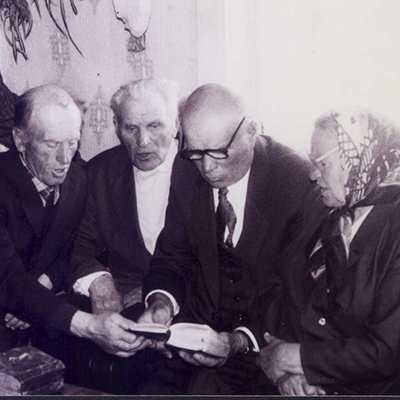 The first chitalishta(pl.) appeared as local independent institutions in the middle of the 19th century and they still exist today, though they are now municipality-dependant. They are centers of cultural-educational activities and amateur creativity. Usually, at the chitalishta there are singing groups and folklore formations, which present the local musical traditions. Performers: The two-voice singing in Nedelino is performed by women, organized in two groups of two singers who sing in antiphony without instrumental accompaniment. Structure: The vertical organization of the Nedelino village two-part singing is similar to that of the Velingrad region. The upper voice performs the melody in a small tone scope. The lower voice follows the development of the upper one, moving on I and IV degree of the sound-order. 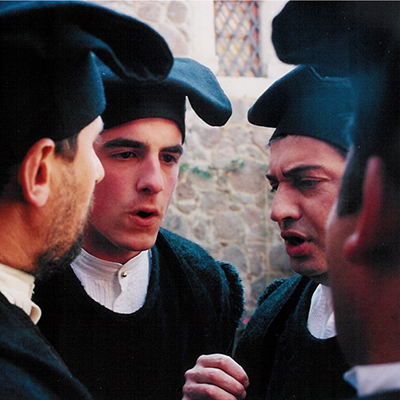 Crossing of the two voices is typical for the Nedelino village two-part singing. There are not any specific ornamental details. Local terminology: According to the local terminology the upper voice vodi, and the lower one sledi. The grouping of the singers is called na chiftove. Functions: The predominating number of songs are performed at working-bees. Other songs are sung at weddings and at table. 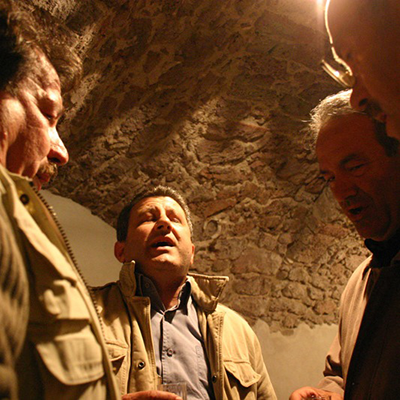 Contemporary state: The two-part singing in the Nedelino village is a living tradition even today. The songs are performed not only by mature and older women but also by young girls. During the recent years cases of two-part songs performed by men have also appeared. The revitalization of the local multipart tradition is much helped by the Nedelino Festival of Multipart Singing. *For more information about the multipart singing in this region see also Kaufman N. 1968: 112-115. The multipart singing in Bulgaria is typical for the rural traditional music of Middle West and South West Bulgaria. 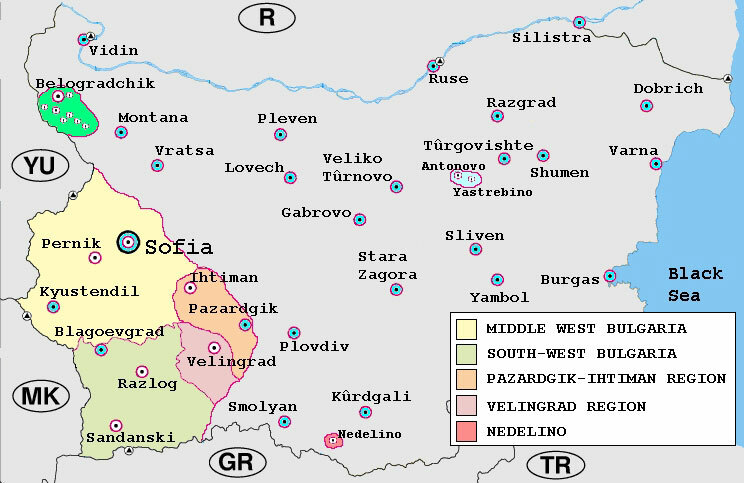 The multipart singing regions in Bulgaria include the Pirin region, a great number of the settlements on the western slopes of the Rhodope Mountains, the Southwestern Rodophe Mountains (Velingrad region), the Kyustendil region, the Pernik region, most of the Sofia region, the settlements in the Pazardgik region situated to the west of the city. According to the specific features of the mode structure, the tone scope and the movement of the second voice, the traditional multipart singing in Bulgaria is divided into four sub-regions: Pirin (Blagoevgrad, Gotse Delchev, Petrich, Sandanski regions), Middle West Bulgaria (Kyustendil, Pernik, Sofia regions), Pazardjik-Ihtiman and Velingrad regions. The islands of multipart singing tradition in East Bulgaria are the town of Nedelino and some settlements in Northeastern Bulgaria (Omurtag region). The multipart singing tradition in these places situated out of the multipart regions is explained by migration of bearers of the tradition from the Northwestern Rhodope Mountains (Velingrad region) to Nedelino and from the Southwestern parts of Bulgaria to the settlements around Omurtag. An addition may be made to the regions defined above, although it is concerning a multipart tradition that is not living today. In some settlements around the town of Belogradchik, North West Bulgaria multipart singing was practiced until the middle of the 20th century. The western and the southern boundaries of the traditional multipart singing in Bulgaria are not identical with the state’s boundaries. The multipart singing tradition has its extension to some settlements in Serbia, The Republic of Macedonia and Greece. The multipart singing in Bulgaria was first note documented in the last years of the 19th century. The first researches on it were made in the 1920s. The first musical records of multipart singing in Bulgaria are on gramophone plates and date back to the late 1930s. The mechanical recording of multipart songs on plates and magnetic tape continues during the 1940s, the 1950s and the 1960s. This ensures a good base for future research on this traditional musical practice in Bulgaria. "BHA" is a unique part of the traditional signature system of the State Soundrecording Company 'Balkanton'. "VVD" is part of the name of a private soundrecording company from Blagoevgrad called 'VVD - Ruichev'. "BNR" is an acronym of 'Bulgarian National Radio'. 1055 Rounder Records, 1990. Two Girls Started to Sing. Bulgarian Village Singing. BHA 10218 Authentic Bulgarian Folk Songs from Plana and Koutela. Vocal Folk Groups. BHA 11020 st. The Songs of Bansko. Male Vocal Group from Bansko lead by Ivan Matsourev. BHA 11383 Bisserov Sisters, “Trakiiska Troika”. BHA 11684 st. Chants from the Shopp Region. Performances of Female Vocal Groups from the Villages of Bistritsa and Simeonovo, Sofia District. BHA 11862 Bisserov Sisters Sing Folk Songs from Pirin. BHA 12322 Authentic Folklore Songs from Satovca and Dolen. BNR, Authentic folklore from Pirin Macedonia, vol. 21, Male Folklore Group from Ribaritsa village in Bansko region and Female Folklore Group from Satovtsha. BNR, Mladi izpûlniteli na avtentitshen Nedilinski folklor, children. BNR, Nedelinski Dvuglas, Georgiev sisters. BNR, Nedelinski Dvuglas, Hadgiev sisters. BNR, Nedelinski Dvuglas, I part. BNR, Shopski Dueti, Mitev brothers. BNR, Female Singers Group from Dolni Lozen village. CD Bisserov sisters & Co., 1998, From the roots to the top, Bisserov sisters and family, CD 10061955 LNM. VVD-Ruichev, 1996, Tsûrno mi oko ergenche, Male Folklore Group from Razlog, MC 219606. VVD-Ruichev, 1997, Pusta Mladost, Rasti Bore i…, Male Folklore Group from Bansko, MC 219707. VVD-Ruichev, 1998, Sbrali se triese bekyara, Male Folklore Group ‘Pirinski grivatsi’ II part, MC 219809. VVD-Ruichev, 1998, Stani Yano, Male Folklore Group ‘Pirinski grivatsi’ I part, MC 219808. 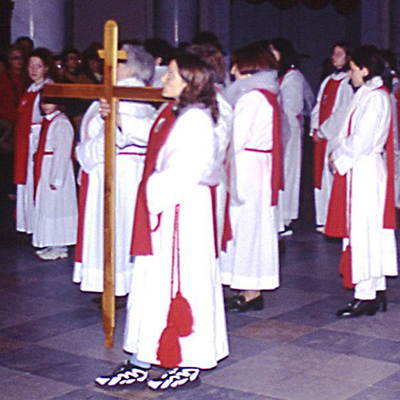 VVD-Ruichev, 1999, 1999-2000 after Christ. Obshtina Sandanski – chitalishte ‘Otets Paisii’– Male Folklore Group, Sandanski I part, MC 219914. VVD-Ruichev, 1999, 1999-2000 after Christ. Obshtina Sandanski – chitalishte ‘Otets Paisii’– Male Folklore Group, Sandanski II part, MC 219915. VVD-Ruichev, 1999, Poslushaite Patrioti, Male Folklore Group ‘Perun’ – Razlog, MC 219921. VVD-Ruichev, 1999, Vo nashe selo, Male Folklore Group ‘Pirinski grivatsi’ and Milen Taskov III part, MC 219917. VVD-Ruichev, 2000, Dessilitza, Folklore Singing Group from Dobrinishte village, I and II part, MC 2100. VVD-Ruichev, 2000, Imate li ruino vino, Male Folklore Group ‘Perun’ – Razlog, MC 219923. VVD-Ruichev, 2000, Imate li vino, Male Folklore Group ‘Perun’ – Razlog. VVD-Ruichev, 2000, Poslushaite Patrioti, Male Folklore Group ‘Perun’ – Razlog, CD 210003. VVD-Ruichev, 2000, Sitno se horo vieshe, Male Folklore Group ‘Perun’ – Razlog, CD 210004. VVD-Ruichev, 2000, Sitno se horo vieshe, Male Folklore Group ‘Perun’ – Razlog, MC 210025. VVD-Ruichev, 2001, Planino, Perin, planino, Male Folklore Group from Bansko CD 210107. VVD-Ruichev, 2001, Planino, Perin, planino, Male Folklore Group from Bansko, MC 210129. VVD-Ruichev, 2002, Mori Trûgnal Yunak, Male Folklore Group from Ablanitsa village, Blagoevgrad region, CD 210213. VVD-Ruichev, 2002, Mori Trûgnal Yunak, Male Folklore Group from Ablanitsa village, Blagoevgrad region, MC 210240. VVD-Ruichev, 2002, Nalei, Krûchmaryu, Male Folklore Group ‘Perun’ – Razlog, CD 210216. VVD-Ruichev, 2002, Nalei, Krûchmaryu, Male Folklore Group ‘Perun’ – Razlog, MC 210243. VVD-Ruichev, 2003, 25 godini Bisserov sisters, Bisserov sisters, CD 210319. VVD-Ruichev, 2003, Vti festival na mûjkite folklorni pevcheski grupi i individualni izpûlniteli. Razlog 2003 [5th Festival of Male Folklore Singing Groups and Individual Performers. Razlog 2003], part I, MC210351. VVD-Ruichev, 2003, Vti festival na mûjkite folklorni pevcheski grupi i individualni izpûlniteli. Razlog 2003 [5th Festival of Male Folklore Singing Groups and Individual Performers. Razlog 2003], part II, MC210352. VVD-Ruichev, 2003, Yubileina kolektsiya - 25 godini Bisserov sisters, Bisserov sisters, MC 210348. VVD-Ruichev, Galchev Engineering Group AG, 2001, Dessilitza, Folklore Singing Group from Dobrinishte village, CD 210104. Gega New. Pusta Mladost, Zdravka Hristova and Pirinka Hristova, GD 264. Gega New. The Bistritsa grannies and their granddaughters, Bistritsa granies and their granddaughters, GD 232. VVD-Ruichev, 2000, Dessilitza, Folklore Singing Group from Dobrinishte village, VC 2100B05. VVD-Ruichev, 2001, Male Folklore Group ‘Perun’ – Razlog, MC 2101B07. VVD-Ruichev, 2002, Zalyubih si edno mome, Male Folklore Group, Sandanski, VC 2102B09. VVD-Ruichev, 2003, Nalei, Krûchmaryu, Male Folklore Group ‘Perun’ – Razlog, DVD 2103B03. VVD-Ruichev, 2003, Nalei, Krûchmaryu, Male Folklore Group ‘Perun’ – Razlog, VC 2103B12. VVD-Ruichev, 2003, Zalyubih si edno mome, Male Folklore Group, Sandanski, DVD 2103B02. Kaufman, Nikolai & Iliya Manolov. 1994. Narodni pesni ot yugozapadna Bûlgaria. Pirinski krai. vol. 2, Sofia, BAS. Kaufman, Nikolai & Todor Todorov. 1967. Narodni pesni ot yugozapadna Bûlgaria. Pirinski krai. vol. 1, Sofia, BAS. Stoin, Vassil. 1959. Narodni pesni ot zapadnite pkrainini. Edited by Raina Katsarova, Sofia, BAS. Stoin, Vassil. 1975. Narodni pesni ot Samokov I samokovsko. Edited by Elena Stoin, Sofia, BAS. Articles and books preceded by an asterisk (*) also include musical transcriptions. Abrasheva, Svetla. 1974. Bûlgarski naroden dvuglas. [Bulgarian folk two-voice singing] Nauka i izkustvo, Sofia. Alexandrova, Boryana. 1983. Kûm vûprosa za usvoyavaneto na folklornata pesennost. [About mastering folklore singing] Bûslgarski folklor, N 3: 29-40. Alexandrova, Boryana. 1990. Za muzikalniya ezik na pesnite, svûrzani s leten zemedelski trud (po materiali ot Blagoevgradska obshtina) [About the music language of the songs related to summer agricultural labour (on materials from the Blagoevgrad municipality)] In: Pirin pee ’85. Izsledvaniya i materiali, Sofia, BAN, p. 105-115. Alexandrova, Boryana. 1991. Harakterni osobenosti na peeneto svûrzano sûs zemedelski trud. [Typical features of the singing related to agricultural labour] In: Bûlgarskiyat folklor v slavyanskata i balkanskata kulturna traditsiya. Problemi na Bûlgarskiya folklor. v8, Sofia, BAN, p. 253-258. Botusharov, Lyuben. 1972. Narodnite pesni v Pazardjishki okrûg. [The folk songs in the Pazardjik region] Bûlgarska muzika, N 3: 41-48. Bratanova, Radka. 1983. Razvitieto na Nedelinskiya dvuglas. [The evolution of the two-voice singing in Nedelino village] Bûlgarsko muzikoznanie, N 4: 78-88. Bratanova, Radka. 2001. Nedelinskiya dvuglas – tshetiri desetiletiya po-kûsno. [The two-voice singing in Nedelino village – four decades later] Bûlgarski Foklor, N 1: 42-45. Ilieva-Shturbanova, Anna. 1964. Muzikalno-folklorni prouchvaniya v Svogensko. [Folklore-musical researches in the Svoge region] In: Izvestiya na Instituta za muzika pri BAN, N 10: 165-216, Sofia. Katsarova, Raina. 1959. Predgovor: Narodni pesni ot Zapadnite pokrainini. [Foreword: Folk songs from the Western outlying districts] Narodni pesni ot Zapadnite pokrainini, Sofia. Kaufman, Dimitrina. 1998. Misteriyata na bûlgarskoto mnogoglasie. [The mistery of Bulgarian multipart singing] LKT Music, Plovdiv. Kaufman, Dimitrina. 1999. Mnogoglasnata struktura – prostranstven model na obredite v prehod. [The structure of multipart singing – a spatial model of the evolution of rites] Bûlgarsko muzikoznanie, N 2: 129-133, Sofia. Kaufman, Dimitrina. 1999. Prostranstveni kodove v strukturata na mnogoglasieto. Bûlgarski folklore, N 3: 21-29, Sofia. Kaufman, Nikolai. 1954. Dvuglasnoto narodno peene v Rodopite. [The two-voice singing in the Rodopi Mountain] Bûlgarska muzika, N 10: 26-28, Sofia. Kaufman, Nikolai. 1958. Dvuglasnoto narodno peene v Bûlgariya. [Two-voice folk singing in Bulgaria] In: Spisanie na BAN, N 4: 45-58, Sofia. Kaufman, Nikolai. 1958. Pesni ot Blagoevgradsko. [Songs from Blagoevgrad region] Bûlgarska muzika, N 3: 27-31, Sofia. Kaufman, Nikolai. 1958. Pesni ot Blagoevgradsko. [Songs from Blagoevgrad region] Bûlgarska muzika, N 4-5: 26-31, Sofia. Kaufman, Nikolai. 1959. Triglasnite narodni pesni ot Kostursko. [Three-voice folk songs from Kostur region] In: Izvestiya na Instituta za muzika pri BAN, N 6: 65-158, Sofia. Kaufman, Nikolai. 1961. Narodnite pesni ot Smolyansko i Madansko. [Folk songs from the Smolyan and Madan regions] In: Izvestiya na Instituta za muzika pri BAN, N 7: 79-208, Sofia. Kaufman, Nikolai. 1963. Dvuglasnite pesni v Sredna Zapadna Bûlgariya. [Two-voice songs in Middle West Bulgaria] Bûlgarska muzika, N 9: 13-19, Sofiya. Kaufman, Nikolai. 1963. Dvuglasnoto peene v Pazardjishko-Ihtimanskiya krai. [Two-voice singing in the Pazardjik-Ihtiman region] Bûlgarska muzika, N 1: 22-28, Sofia. Kaufman, Nikolai. 1965. Narodnata muzika v Pirinskiya krai. [Folk music in the Pirin region] In: Izvestiya na instituta za muzika pri BAN, N 11: 149-219. Kaufman, Nikolai. 1967. Narodnoto mnogoglasie v tvorchestvoto na bûlgarskite kompozitori. [Folklore multipart systems in the creations of the Bulgarian composers] Bûlgarska muzika, N 10: 4-11. Kaufman, Nikolai. 1968. Bûlgarskata mnogoglasna narodna pesen. [The Bulgarian multipart folk song] Nauka i izkustvo, Sofia. Kaufman, Nikolai. 1980. Ednovremenni i mnogoglasni oplakvaniya na pokoinitsi. [Simultaneous multipart bewailing of deceased persons] In: Vûprosi na etnografiyata i folkloristikata (Izsledvaniya v chest na Hristo Vakarelski). p. 140-146, Sofia. Kuteva, Elena. 1976. Ladovo-harmonichni i kompozitsionno-strukturni osobenosti na pesnite "na visoko" i kombiniranite chetiriglasni pesni. [Mode-harmonic and compositional-structural features of the “on high” songs and the combined songs of Tshetrigrad type] In: Sbornik Bûlgarsko muzikoznanie, vol. 3: 30-70, Sofia. Messner, Gerald Florian. 1980. Die Schwebungsdiaphonie in Bistrica. Tutzing 1980. Messner, Gerald Florian. 1988. Za edni konsonans, za drugi disonans. (Kato zvыntsi li zvыnyat, ili viyat kato vыltsi? – Interferentsionnata diafoniya mejdu muzikalnite ponyatiya konsonans i disonans) [Consonance for some, dissonance for others. (Do they sing as bells or rather howl like wolves? – Interferentional diaphony between the notions consonance and dissonance)]. Vtori Mejdunaroden Kongres po Bûlgaristika. Dokladi. Folklor. BAS Sofia, 376-387. Peycheva, Lozanka. 1991. Horovodnite pesni ot Kyustendilsko i Stankedimitrovsko (Funktsionalna, tipologicheska i istoricheska harakteristika). [The dance songs from the Kyustendil and Stanke Dimotrov regions (Functional, typological and historical characteristics)] Ph. D. Dissertation, Institut za folklor, Sofia. Peycheva, Lozanka. 1991. Folklorno znanie za muzikata (Po materiali ot Kyustendilsko i Stankedimitrovsko). [Folklore knowledge about music (On materials from the Kyustendil and Stanke-Dimitrov regions)] Bûlgarski folklor, N 1: 15-26, Sofia. Rice, Timothy. 1990. Kûm razbiraneto na triglasnoto peene v Bûlgariya: vzaimodeistvie mejdu teoriya i praktika. [About understanding the three-voice singing in Bulgaria: a relation between theory and practice] In: Muzikalni horizonti, 1990, N 6 22-34. Stoin, Elena. 1958. Dneshnoto sûstoyanie na narodnata muzika v Severozapadna Bûlgariya. [The contemporary state of the folklore music in North-West Bulgaria] Kompleksna nauchna ekspeditsiya v Severozapadna Bûlgariya prez 1956 g. , Sofia, p. 365-385. Stoin, Elena. 1961. Narodnata pesen v Trûnsko i Kyustendilsko. Kompleksni nauchni ekspeditsii v Zapadna Bûlgariya, Trûnsko-Breznishko-Kyustendilsko prez 1957 i 1958 g, [The folklore songs in Trun and Kyustendil regions. Research expeditions in West Bulgaria, Trun-Breznik-Kyustendil region, in 1957 and 1958] Sofia, p. 447-480. Stoin, Elena. 1970. Narodnata muzika v Sredna Zapadna Bûlgariya. [The folk music of Middle West Bulgaria] Izvestiya na instituta za muzika pri BAN, N 15: 97-186. Stoin, Elena. 1981. Muzikalnofolklorni dialekti v Bûlgariya. [Musical-folklore dialects in Bulgaria] Muzika, Sofia. Stoin, Vassil. 1956. Hipoteza za bûlgarskiya proizhod na diafoniyata. [A hypothesis of the Bulgarian origin of diaphonia] In: Bûlgarska narodna muzika, Nauka i izkustvo, Sofia, p.83-97. Zaharieva, Svetlana. 1981. Vasil Stoin i negovata "Hipoteza za bûlgarskiya proizhod na diafoniyata". [Vasil Stoin and his “Hypothesis about the Bulgarian origin of the diaphonia phenomenon] Bûlgarsko muzikoznanie, N 3: 38-40, Sofia. Zaharieva, Svetlana. 1984. Kûm vûprosa za proizhoda na mnogoglasieto. [About the origin of multipart singing] Bûlgarsko muzikoznanie, N 1: 62-75, Sofia.